Blue spruce (Picea glauca) branches (and other spruce varieties) create colors from light to dark teal-greens and grays. As an evergreen, popular for holiday decor, it is an excellent source for a winter dye. The color produced by blue spruce is especially stunning on wool, and winter is a good time to dip-dye an extra-thick knitted woolen winter blanket to bring the essence of outdoor evergreens into your home. Spruce produces an aromatic and visually wondrous dye bath. This ombré dyeing project is a great way to spruce up your home by reusing your holiday tree and winter celebration decor. Melted snow water can be a great extra element to work with if you live in a snowy climate; it is a softer water containing fewer minerals and chemicals than tap water. 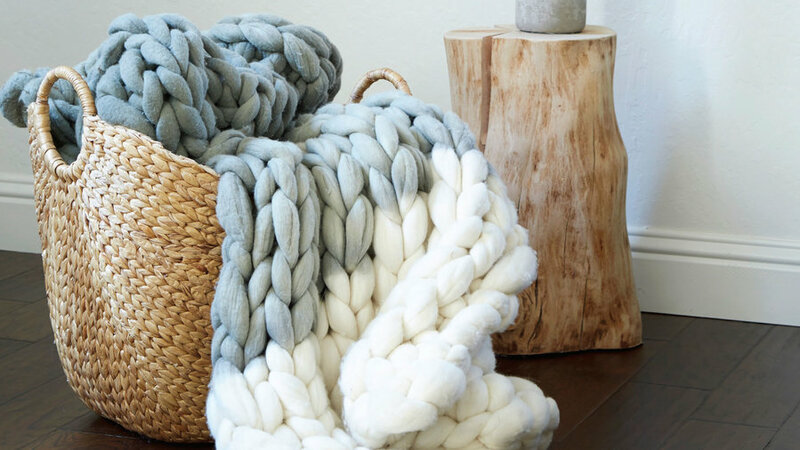 Make sure that your woolen blanket is knitted from clean 100-percent natural wool, ready to absorb dye. Soak half of the blanket you wish to dye in lukewarm pH-neutral soap. Do this close to the dye pot, as the chunky wet wool will be heavy and you won’t want to squeeze or wring it since that could felt your blanket. Gently premordant the soaked half of your blanket with aluminum sulfate and cream of tartar, if using. Add the spruce pieces and all needles to a large stainless steel pot two-thirds full of water. Simmer for 40 minutes to 1 hour to draw out as much color from the branches as possible. At this point, you can turn off the heat and let cool to lukewarm temperature—again, to avoid felting the blanket. When the dye bath is lukewarm, scoop out the branches and needles with a strainer. Add the iron powder. The dye bath will turn teal-green. With the partly wetted blanket supported on a nearby surface, gently squeeze out excess water. Raise the heat to a low simmer to dip-dye the edges. Lower the edges into the dye bath. You’ll need to hold the blanket so only the edges rest in the dye bath, and keep an eye on it for 20 minutes or more to get stable color. The longer you let the edge of the blanket steep, the more saturated the color. You can also turn off the heat entirely after 15 minutes and let the blanket slowly steep overnight. Be aware that the dye may wick up farther into the woolen blanket, however, so anticipate this when you dip the edges and leave some room for the color to spread higher.